The schisms in the Republican Party that helped clear the path for Mr Donald Trump to emerge as pack leader crystallised further on Super Tuesday, leaving the outspoken billionaire in a dominant position after the single biggest day of the 2016 primary season. Mr Trump did not sweep all 11 states picking a Republican nominee on Tuesday, but no other candidate was able to perform well enough to make a strong case to be the anti-Trump candidate. Senator Ted Cruz defended his home state of Texas, and picked up neighbouring Oklahoma as well as Alaska, Florida Senator Marco Rubio got his first win of the campaign in Minnesota, and former Ohio governor John Kasich pushed Mr Trump all the way in Vermont - meaning the field will continue to be splintered as it heads into the next big primary day two weeks from now. "The way people hypothesise it, it is that the way to beat Donald Trump is by having more people drop out," Republican pollster Kristin Soltis Anderson told The Straits Times. "But you have a scenario where enough people have just enough of a glimmer of hope and the field does not coalesce." Similarly, Dr James Henson, director of the Texas Politics Project at the University of Texas, said he expected Mr Trump's two closest competitors to remain on a collision course with each other. So long as the field remains divided, Donald Trump's path to the nomination remains more likely, and that would be a disaster for Republicans, for conservatives and for the nation. The pundits say we're underdogs, I'll accept that. We've all been underdogs. Once we get all of this finished, I am going to go after one person: Hillary Clinton. "As long Marco Rubio can continue to bring in funds, he will continue to play what is essentially a game of chicken with Ted Cruz, in which they keep driving their cars directly towards each other, waiting for the other one to swerve," he said. Indeed, apart from attacking the front runner, both Mr Rubio and Mr Cruz also urged each other to step out of the way. Speaking at an event in Texas, Mr Cruz urged the party to get behind him: "For the candidates who have not yet won a state, who have not racked up significant delegates, I ask you to prayerfully consider our coming together... uniting. We welcome you on our team, united as one. That is the only way to beat Donald Trump." Mr Rubio did not hold an event but told CNN in an interview that the contest is moving out of the evangelical southern states that supposedly favour Mr Cruz and into areas more favourable to him. "Tonight was supposed to be Ted Cruz's night. He was supposed to have that southern firewall, it didn't happen... If you look at the map now, at the states that are to come, that's where we are really going to catch fire," he said. On Saturday, another four states - Kansas, Kentucky, Louisiana and Maine - hold their contests but already attention has shifted to March 15, when the two key swing states of Ohio and Florida cast their vote. Both states are considered crucial to any candidate hoping to win the presidential election in November. Mr Trump was already campaigning in Florida as Super Tuesday votes were being counted. He ended the night with victories in seven states, including a key triumph in Virginia. The state was positioned as a key test of the ability of establishment Republicans to stop him. Virginia, which borders the American capital, is home to a large population of the so-called anti-Trump coalition, but the more conservative southern portion of the state ultimately carried Mr Trump to victory by three points. 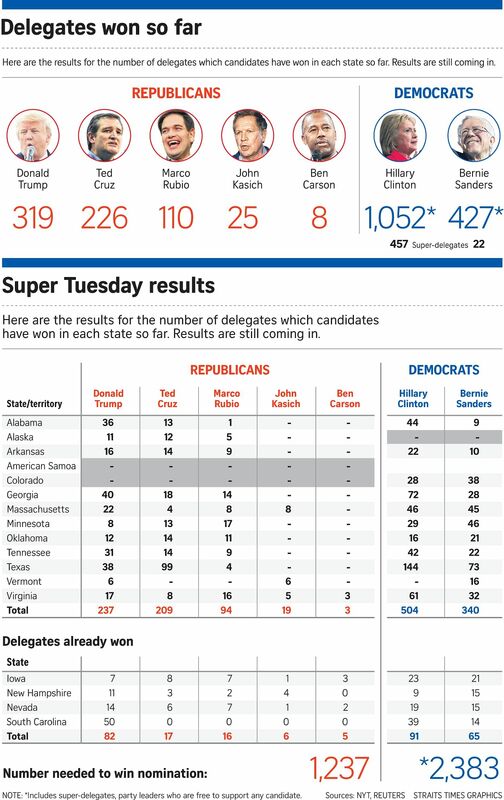 As at press time, Mr Trump had garnered 285 of the 1,237 delegates needed to win the party nomination. Mr Cruz had 161 while Mr Rubio had 87. And while his competitors continued to pledge to fight to the end, Mr Trump appeared to now be preparing himself for a race against Democratic front runner Hillary Clinton. At his press event in Florida on Tuesday night, he appeared to give a glimpse of what he would be like as the Republican nominee. Appearing alongside New Jersey Governor Chris Christie, he toned down his normally hostile posture towards the press, held back his attacks on his Republican rivals and portrayed himself as a candidate who can bring the party together. Pointing to the high turnout in the Republican primaries, he said: "I am a unifier. I know people are going to find that hard to believe but, believe me, I am a unifier." Issuing a warning to his Democratic rival, he added: "Once we get all of this finished, I am going after one person: Hillary Clinton."